Unless you count skiing down Second Ave during a snowstorm, NYC doesn’t offer much in the downhill department. The good news is, there are many legitimate ski resorts within a reasonable distance of the city. Even better: You don’t need to hassle with renting a car (or borrowing one from your friend) to get to them. This foolproof guide to the best skiing near NYC has you covered, from the most convenient city-based bus and train routes to get you on the slopes to where to après-ski when you’re done. Whisk yourself away for a unique winter retreat aboard a brand new Pullman Rail Journeys trip that is tailor-made for New Yorkers. Travelers who book this all-inclusive package in the Adirondacks will get two-day lift tickets to Gore Mountain -- home to Cirque, the longest gladed trail in the Northeast -- plus dome car dinners, and the chance to sleep in luxuriously restored Pullman cars that celebrate the glamorous golden age of rail travel. After a scenic ride from the city to world-class slopes, you’ll be ready to get active on a trail like Twister, a long, wide blue run, one of many beautifully groomed trails across four peaks of alpine terrain. Cozy up by the Saddle Lodge fireplace with a bowl of brisket chili and a Bear Naked Ale from Adirondack Brewery, or grab a drink at the pop-up ski lodge at the historic 1930s North Creek depot before settling in for a romantic night off -- er, on? -- the beaten tracks. How to get there without a car: Book the Pullman Ski Train getaway, which starts from Penn Station every weekend from January 13th-March 26th, 2017. One-click-and-you’re-there ski trips near the city don’t get easier than Thunder Ridge. It might not boast the biggest mountain, but this family-owned operation’s got everything skiers and snowboarders need for a quick and dirty powder fix. On weekends and holidays, take the Metro-North Thunder Ridge Ski Train to Patterson, where a free shuttle will be waiting to transport riders -- and their discounted lift tickets -- to the gondola. Throughout the more than 100 acres of skiable terrain, beginners will enjoy gentle trails such as You Can Do It or Little Thunder, while more advanced riders will revel in the many black-diamond trails like Wildcat and Timber Wolf. How to get there without a car: Book the Metro-North Ski Train for discounted rail and ski/snowboard packages from Grand Central/125th St.
Just 50 miles from Manhattan, Jersey’s Mountain Creek is one of the easiest day trips for good skiing. The biggest draw of MC is for park skiers -- the 65-acre terrain park is one of the best in the US -- but the Bear and Granite Peaks have legit expert steeps, and the base area at Vernon is perfect for beginners. Tap into skiing’s European roots with après at Biergarten, which goes full-on Germanic with slope-side beer and brats. And, while Mountain Creek is practically within walking distance of NYC, the spa and tropical biosphere at the Grand Cascades Lodge make it worth the overnight stay. 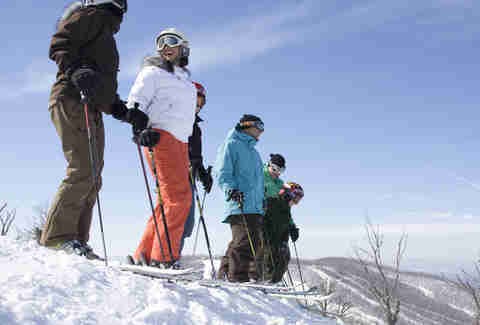 How to get there without a car: Urban Sherpa and NYC Snow Bus provide bus transport to Mountain Creek from New York on the weekend, and the resort offers discounts on lift tickets and lodging to Zipcar users. 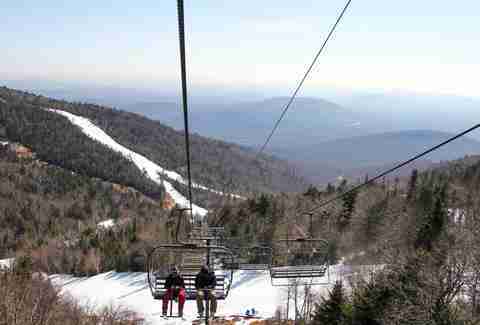 New Yorkers feel a bit of a sense of ownership when it comes to Belleayre, and they’re right to -- the mountain is owned and operated by New York State’s Olympic Regional Development Authority, and before that the Department of Environmental Conservation. The public/private partnership has developed an unassuming, laid-back culture. There’s not a whole lot to do at Belleayre after the lifts shut down for the night, but nearby Brio’s is a good option for wood-fired pizza to pack on calories after a day of skiing. How to get there without a car: The Adirondack Trailways Ski Bus provides daily service from the Port Authority Terminal to Belleayre, and the I Love New York Ski Bus covers weekends during ski season. 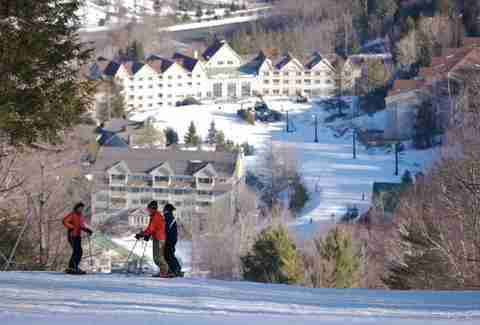 For a relatively small resort, Windham Mountain has a lot going on. For an extra 15 bucks, you can reserve a spot in the mountain’s First Tracks program and get early access. If you’re looking to safely practice aerial tricks, a pass for Windham’s Big Air Bag lets you launch onto a huge, inflated cushion. There are other attractions beyond mere skiing, as well. 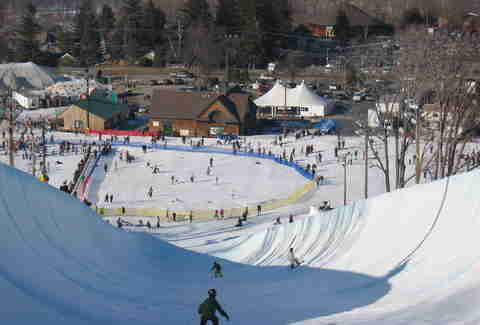 The resort’s Adventure Park features 40ft-high ziplines and an eight-lane snow-tubing course. Rather than stay in one of the myriad local motels or inns, it’s worth the splurge for The Roxbury. With rooms themed around tombs, wizards, and even the inside of a pie (yes, really), the “boutique” lodging manages to turn kitsch into art. How to get there without a car: A number of charter services and bus lines, including Urban Sherpa, OvR, and NYC Snow Bus, provide weekend bus service to Windham Mountain. Jiminy Peak is THE spot for green-minded skiers as the only mountain resort in North America to generate its own energy using alternative wind power. The Zephyr, a massive wind power turbine, sits on the mountain’s summit. The turbine pumps energy into the largest ski area in Southern New England, 1,150ft of vertical packed in equal measure with Boston and New York skiers. The Country Inn at the base of Jiminy is classic all-in-one resort lodging, with hot tubs, a spa, an in-house restaurant within a short, ski-booted walk. There’s a bountiful array of food and shopping options in the surrounding Berkshires, like the Olde Forge in Lanesborough that has a straight-up excellent beer list and some of the best wings you'll get anywhere. How to get there without a car: The Island Ski Tours bus offers both midweek and weekend rides to Jiminy Peak. 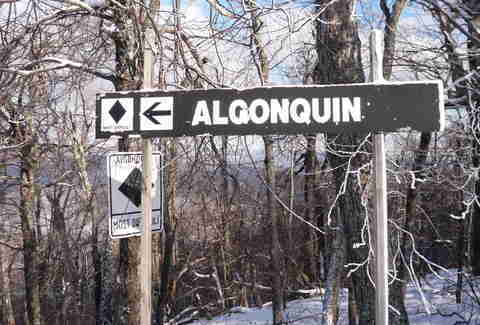 For more than half a century, Mount Snow has been the ski area go-to for New Yorkers. Snow offers a huge variety of terrain, from steeps off the North Face to wide-open cruisers under the lifts like the appropriately named Exhibition and Ego Alley. Mount Snow is also one of the few areas in the Northeast that doesn’t shut down early, with village entertainment that runs well into the night. End the ski day at the green, eco-friendly Naturespa for a massage, then massage your liver with some hot-cider-meets-alcohol drinks at The Silo and burgers made to order at 1900’ Burger. The Snow Barn is the best spot nearby for late-night reveling, with loads of local beer on tap and live music every weekend. How to get there without a car: The Vermont Translines bus line and the Amtrak Vermonter both connect to Brattleboro, and the free MOOver shuttle gets skiers from Brattleboro to Mount Snow. 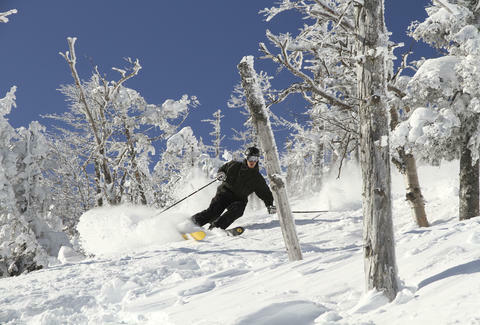 Adventure Northeast Bus Service and the EZ Ski Bus provide charter service from NYC to the resort. Stratton is a model of skiing efficiency -- with a gondola, four six-person lifts, and a number of high-speed chairs, it has some of the best lift ops in the country. 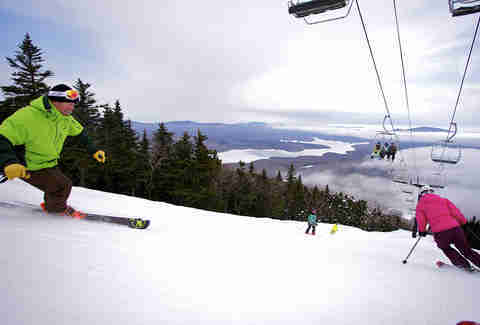 It all services one of Vermont’s largest ski areas, with nearly 100 trails spread across 670 acres of terrain. The shiny veneer of the mountain, thankfully, doesn’t mean Stratton is all sunshine and rainbows. The après scene has a wonderfully grimy side; the Green Door is a bona fide Vermont dive bar, and Grizzly’s is as raucous as ski bars get. 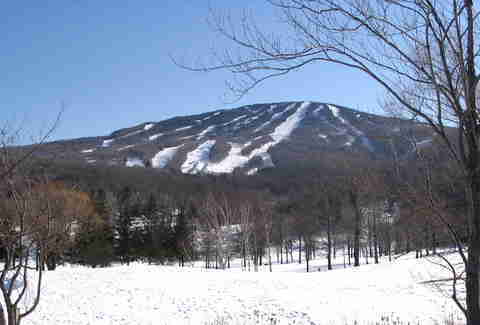 If you’re the type to plan your ski trips around an event (you are), aim for 24 Hours of Stratton in January. A ski-a-thon that raises money for a local charity, the event is one of your few chances in the US to ski straight through the middle of the night and into the early morning... legally. How to get there without a car: OvR and Adventure Northeast both offer charter bus trips from the city to Stratton. 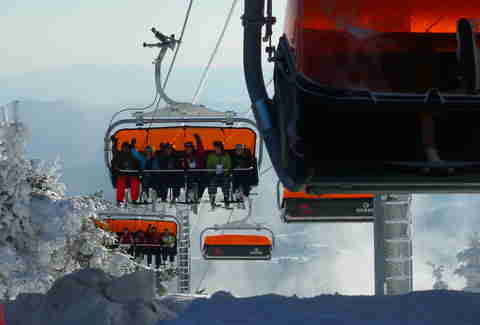 With North America’s first (and only) heated six-person chairlift -- the Sunburst Six -- skiing at Okemo is one of the region's most luxurious winter-sports experiences. Each of the resort’s four peaks is home to at least one high-speed quad, as well, which gives Okemo a hell of an uphill capacity and keeps lift rides short and comfy. Reward sore glutes with a deep tissue massage at Aveda Concept Spa at the historic Castle Hill Resort, which offers affordable ski-and-stay packages and the sense you’ve just traveled to the English Cotswolds. End the day at Tom’s Loft Tavern, which humbly proclaims itself "Home of Lousy Food, Warm Beer and Grumpy Owner." How to get there without a car: The EZ Ski Bus runs from New York to Okemo every Saturday and Sunday, and Amtrak's Ethan Allen Express drops off in nearby Rutland. Killington isn’t just a big ski area “for the East coast,” as holier-than-thou Western skiers might put it -- with more than 750 acres of skiable terrain, the "Beast of the East" is big anywhere. Bonus: You get two resorts for the price of one -- tickets to Killington also work at neighboring Pico, a rustic hill that hangs onto powder for days after it gets tracked out at the Big K. And, with a commitment to being among the first ski areas in the country to open and the last to close (and sometimes capturing both), there isn’t a bad time to ski Killington. 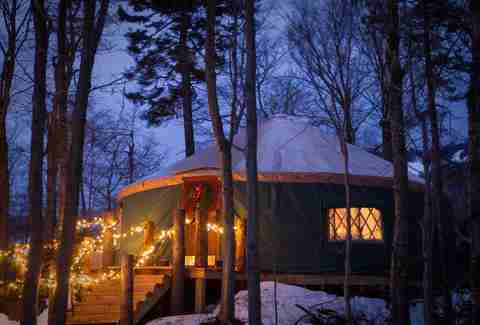 Eat at the Ledgewood Yurt, an on-hill restaurant accessed by skis for lunch and by snowcat-drawn sleigh ride for dinner. How to get there without a car: Both the Urban Sherpa and OvR bus services travel from NYC to Killington every Saturday. Amtrak's Ethan Allen Express services Rutland, just a few miles from the resort. 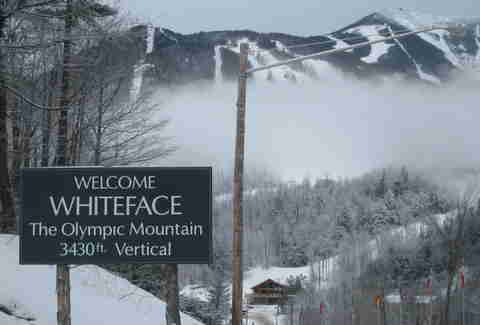 Of all the ski areas in the Northeast, there’s nowhere you’re more likely to rub elbows with Olympians than Whiteface. 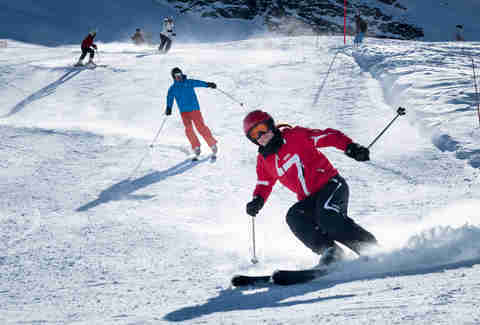 The resort played host to the Winter Olympics in the 1980s, and continues to host competitions and training on its slopes and on-site facilities. It’s also one of the best places around for off-piste "sidecountry" skiing, with hike-in access to 35 acres of steep, narrow chutes and glades from the summit. The best way to experience Whiteface is by fulfilling your athletic/Cool Runnings fantasies by bobsledding, cross-country skiing, and riding the luge. You can eat and drink local with après at the Lake Placid Pub and Brewery, which has been brewing since 1996. In between schussing and sloshing, explore the quintessential ski village, where a new "Cool Globes" climate change exhibit will be on display outdoors this winter and the 5-Green Leaf Golden Arrow Resort is the perfect launch pad for dog sledding across Mirror Lake. How to get there without a car: Adirondack Trailways’ bus line runs from New York City to Lake Placid, and the Mountain Valley Shuttle provides free transport around the resort. Josh Christie is a freelance writer and the co-author of the Maine Outdoor Adventure Guide. He lives and works in Southern Maine. You can follow him on Twitter at @jchristie. Lauren Matison is a travel writer and co-founder of offMetro.com who you may spot kicking up powder in a hot pink vintage ski onesie this winter. Follow Lauren on Instagram and Twitter.